Our Online Book Club is off to a great start this year. For the month of January we have been reading and discussing “The Girls” by Lori Lansens. This book, with it’s lovable and unique characters, has left us with no shortage of material for discussion. It made us laugh, it made us cry, it shocked us and it inspired us. Overall, we give this locally set fictional memoir a unanimous two thumbs up. Love is in the air…or at least it will be in the month of February when we read “The Night Circus” by Erin Morgenstern. We’d love for you to join in our discussion. 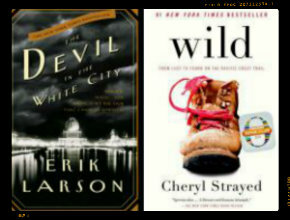 For March we’ve decided to go with a non-fiction theme, and we’ve narrowed it down to two choices. You can cast a vote by visiting our Online Book Club Poll. “Their fates were linked by the magical Chicago World’s Fair of 1893, nicknamed the “White City” for its majestic beauty. Architect Daniel Burnham built it; serial killer Dr. H. H. Holmes used it to lure victims to his World’s Fair Hotel, designed for murder. Both men left behind them a powerful legacy, one of brilliance and energy, the other of sorrow and darkness.” (Description from Random House). Click here to listen to an audio sample of this book. Click here to watch the Wild book trailer. Do you have any suggestions for future Book Club reads? We would love to hear them!